In my work as a life coach a typical first session with a client starts out by going over a few basic ideas as a cornerstone for the work we’ll do together. I refer to these concepts as the slight edge principles, a term that I borrowed from the excellent book, The Sight Edge by Jeff Olson. If you haven’t read this book you should put it on your “to read” list for 2016. It is one of the first books I recommend to all my clients. By going over some of the principles found in the book and a few more of my own it gives us a foundation of what you could call ground rules. I thought I’d share a few of my favorite principles here that have helped not only my clients but have served me well in my own life. I”m here showing up writing what is in my heart and you are here showing up as the reader, ready to find out what I have to say. That is how the world moves forward. Everyone showing up playing their part. “Eighty percent of success is showing up,” as quoted by Woody Allen. I work with several alternative modalities and sometimes these new tools are a bit edgy and push people outside their comfort zones. I tell my clients that looking at old problems from a new perspective is not easy. But if you take to heart the saying, “If you want something different you’re going to have to do things you haven’t done before,” then showing up with an open mind that permits you to go outside your comfort zone is paramount to success. Success, however, has a greater chance of happening when the next principle is applied…. It’s important to understand that each of us didn’t get to where we are in a short period of time. You got to where you are over years of consistently having the same thoughts, the same habits, the same behaviors, being around the same people and thus getting the same results. Therefore, any change you want to make in your life, such as reaching a goal, is probably not going to be achieved over night. That’s not to say that progress can’t speed up at times and dramatic changes can happen quickly. There is such as a thing as the grace of God. While you’re waiting for God’s grace to touch you be a person of action. As the old adage says, God helps those who help themselves. For most people it’s not that they don’t know how to help themselves. Often the process is not outside their abilities. EFT (tapping) for instance, is a very simple process. (Read my blog about tapping.) The reason people don’t achieve their goal is because they don’t do the “how” long enough. And there could be a number of reasons why people stop themselves. That’s for another discussion and often what life coaching is about. The important thing is the concept that to reach a goal it is important to be a person who does small things consistently over a long period of time. The principle of consistency, however, needs another principle for support. Consistency of action requires discipline. In other words discipline needs a “why” behind the “how” to fuel the discipline to be consistent. You not only have to know how to achieve a goal – the process – and you have to be consistent in your actions, you also have to know “why” you want to achieve the goal in the first place. Without the why – your burning desire – you’ll run out of steam. It’s hard to stay motivated, focused disciplined and consistent when you don’t have a foundation built on a deeply imbedded burning desire. What does a burning desire require? That’s leads us to the next principle. My favorite quote on faith comes from the bible, Hebrew 11:1 which I’ll paraphrase here. The principle of having faith is an old one. It’s old because it’s true. Faith is personal and it takes work to build a strong faith, especially in these turbulent times. Faith is really about believing in something beyond detection of our fives senses. Faith is a present feeling about a future experience. One needs to have faith that the effort they apply to the “how” will produce the results they desire. AND – this is really important – these results will give them a feeling that is connected and directly related to their burning desire. Here’s a simple exercise I got from my friend Christopher Smith who has a workshop called Thought Writing. Write down a goal you have. On the next line write your goal again and then write the word because…and fill in the blank. Then write that sentence ending with because…and fill in that blank. Keep doing this exercise until you get to the deepest part of what your burning desire is and it will probably be connected to a feeling. Try it. You’ll be amazed at what you’ll find In-side once you go searching. If you have trouble with discovering your burning desire then this leads into the next principle. There is an element of surrendering to the idea of perfect timing that many people fail to embrace. To know what direction we need to take or to get in touch with our burning desire sometimes it takes an act of surrender. We need to surrender to God’s timing which is also called perfect timing. There is a season for everything. Just look out a nature and watch how all the color of the world, in particular the flowers, emerge and bloom at different times. We could learn a lot from watching a sunflower – showing up first as a seed ready to face the darkness of the ground, instilled with a burning desire to be who it is meant to be, consistently day after day pushing through the dark; having faith that nourishment comes; and then finally facing the light, surrendering to the perfect time to bloom. When that sunflower seed is in the ground it may know it is a sunflower inside without any evidence on the outside. Even when it starts to grow and surface it still does not “look” like a sunflower. It must have faith that in perfect timing it will bloom and the burning desire to be a sunflower will become a reality for all to see. Life is not easy and yet it doesn’t have to be as hard as we make it to be. If you live with certain principles at the core of who you are and use them on your journey, you will feel lighter, you will find it easier and more fun to pursue your goals and thus your journey will be a testament to God’s desires – that we all bloom and grow. 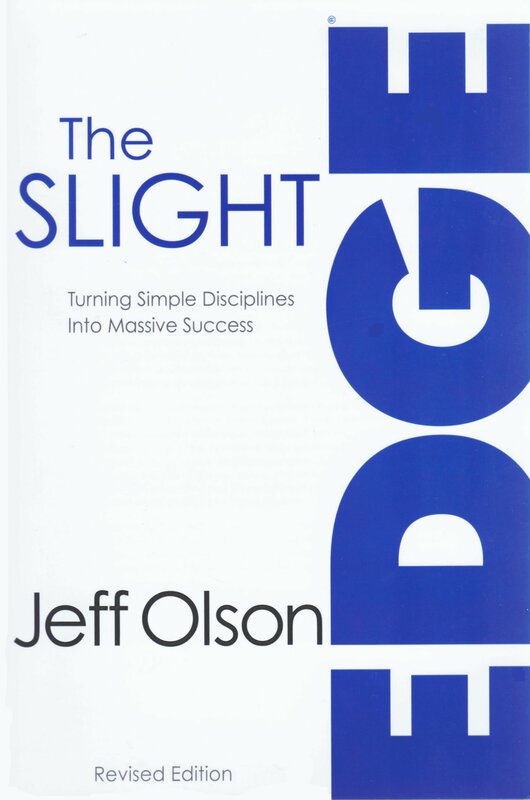 Intrigued by the slight edge principles? Read The Slight Edge by Jeff Olson. Until then watch this slide show of the slight edge principles HERE.